I’m about to go all Tennyson on you now, so be ready. 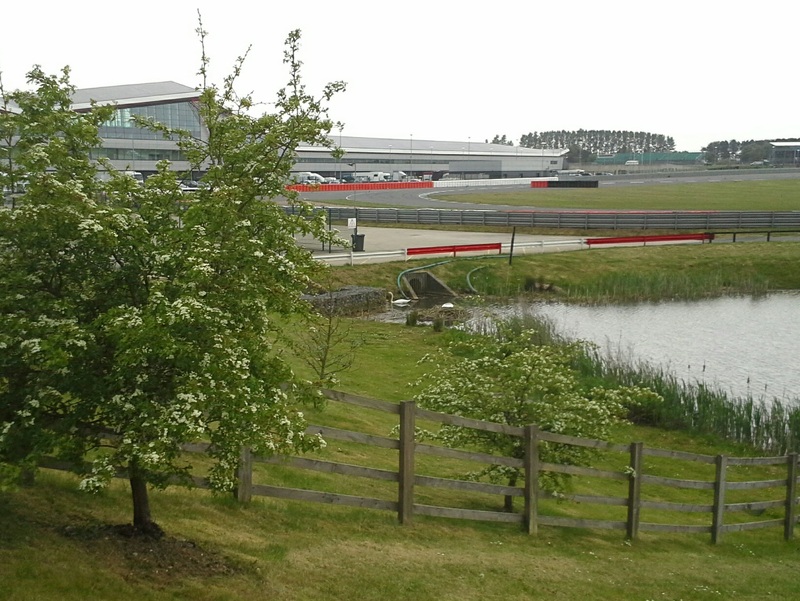 Silverstone has a swans’ nest. A swan nest is a huge thing. If there’d been swans in Castaway, Tom Hanks would have filched that flotilla for his escape, probably boiling the giant egg as a snack and leaving Wilson as a poor substitute. But I didn’t even realise Silverstone had a lake. It does. Behind the grandstand, drivers’ right of the international pit entry. 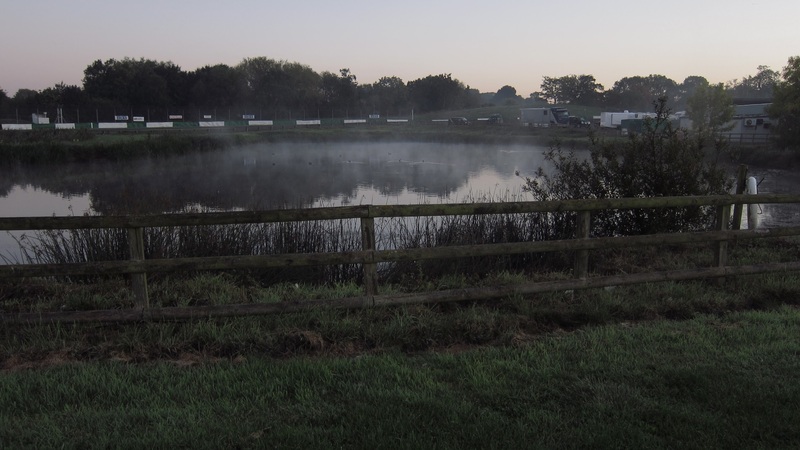 A slightly smaller circuit, Mallory Park, probably has a greater surface area in its lakes than the tarmac of the track. And camping there is simply beautiful. Opening the door of your tent in the morning to see the mist rising off the water, hearing the calls of the egrets and great-crested grebes, is a joyous experience. I’ve not checked, but I guarantee there are newts there, laying their eggs in the water forget-me-not. Cadwell Park has buzzard nests in the copse above Coppice, and I’ve seen jackdaws exploring holes in the trees around Barn in early spring. Treecreepers also make their home around Hall bends. Grey squirrels and rabbits explore the banking. If your airbed goes down in the night because you stole it from your ex and karma is after you and you wake up with a tussuck digging into your hip, you might just catch the call of a barn owl. Back to Silverstone and an observation. I recently made a small pond in my garden, and over the past few months I’ve been waiting for it to be populated by bugs, critters and wrigglies, but it’s a slow process. In contrast, at the airfield circuit the night rains came heavily and filled little gullies around the debris fencing with water, in which emerged all kinds of diving beetles and larvae, presumably sat dormant beneath the soil. Then the sun came out and a red kite took the backsweep of its tale for a circuit over scrutineering. Being on post is a bit like bird-watching. You stay all day in one spot with a flask, adding or subtracting layers of clothing. You come home sunburned, windburned or with a cold. And sometimes very little happens. Then you hear a screech; you turn, your attention illuminated and some output of perfect evolution wheels through your view. What differentiates this twitching from the other is reaching for a flag or extinguisher over a camera or field guide. Late last year I set out some objectives for 2017. I go in to this kind of thing with huge optimism and this image of myself as a driven, focused dude killing it. The kind of ‘every decision you make should be in aid of your goal’ mentality. I am not this person. I mean, I can set goals and do the thing, but the more grandiose I go… I can get carried away. BUT. Here goes. Maybe I’ll make it to LM24, maybe not. But I’d love to. To that end, I’m doing as many endurance races as I can. I’ve also been learning some French. I mean, like every day. For a week. Then… Less often. Then more again. I also want to do some new stuff, like new tracks, new series. Anglesey is on, and Croft. And I’m doing F1. Yeah. But also need to do some different duties at the track, maybe start line or pitlane or fire tender. The trouble is that to do F1, you need to have performed the duty you’ll take a certain number of times in the last year. So if I want to flag the BGP, I need to do a ton of flagging the year previously. 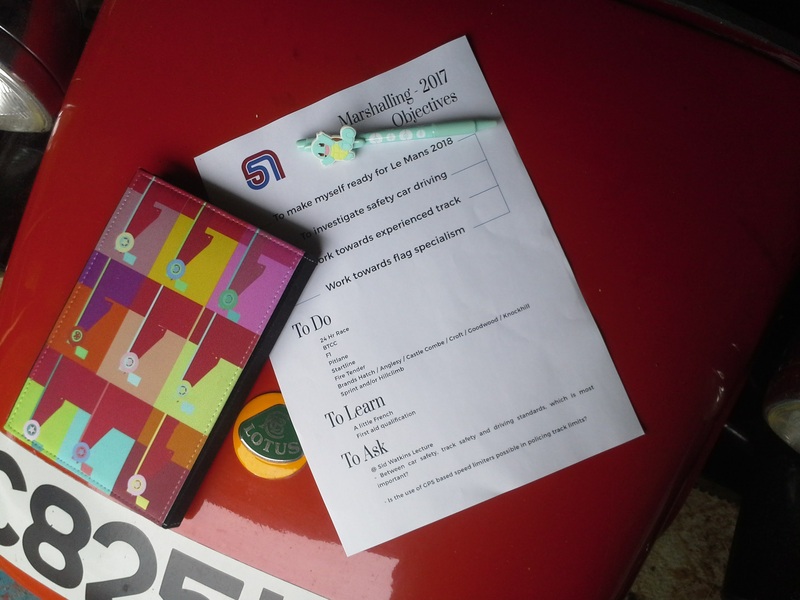 Organising your year around that means struggling to fit other stuff roles in. But yeah, with a trackday done, maybe doing some fire tender would get me a little closer to safety car-ing that up. Need more trackdays. Maybe eventually an ARDS test. There’s no chance of any racing for me, ever. Finances preclude it. So if I want to do this, I need to attack it from a different direction. But that’s a slow burner. 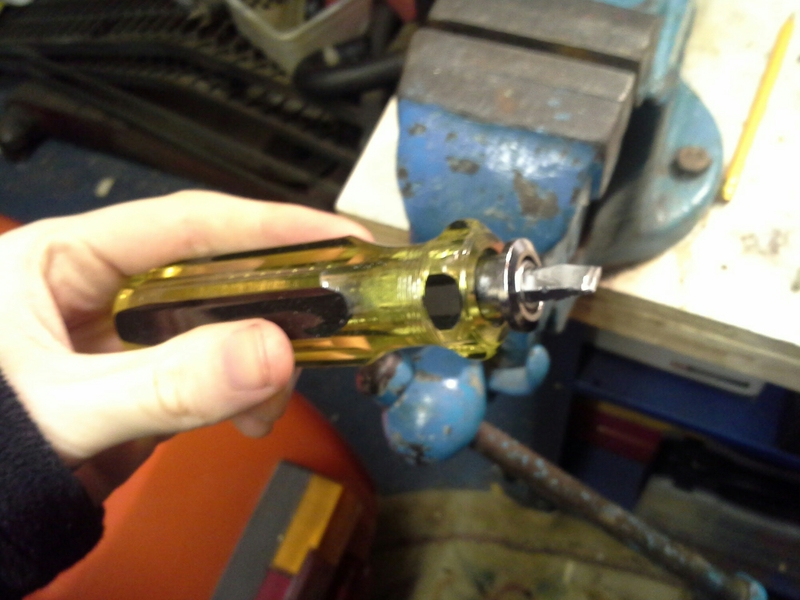 Being the sort of person who over-thinks everything, I decided to customise a screwdriver for incident marshaling. I looked online for a switchable screwdriver that would fold or retract into the handle, but none looked sturdy enough. I guess most would just buy a multitool and that would be fine and you probably never use them anyway but speaking of tools I’m a spanner so chose the difficult option. This chap retracts into the handle, has a Philips on one end and a flatty on the other. But it only retracts as far as shown in the piccy above, and I didn’t much fancy falling over off the tyre wall, in the gravel, on the slippery grass, down a rabbit hole or wherever I end up falling over, and getting penetrated by four inches of hardened steel. 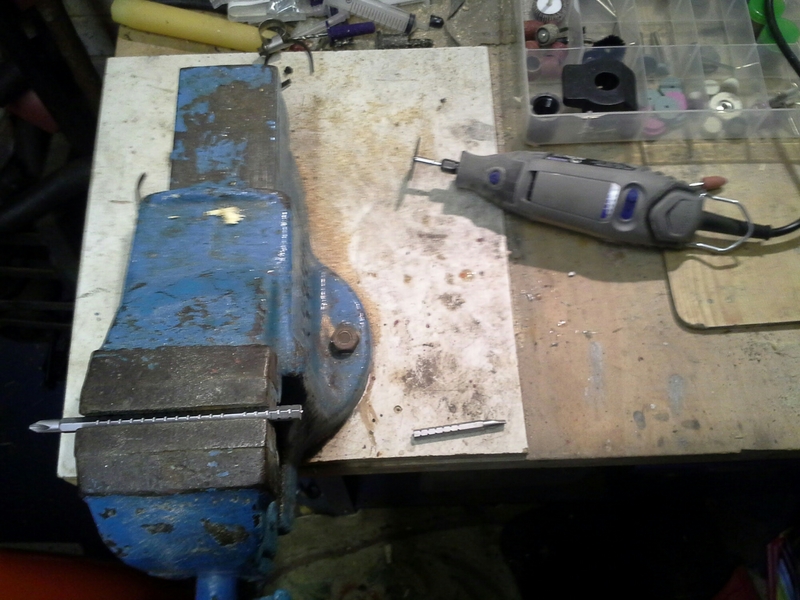 So I sliced the end off (the flatty end) and machined (read ‘butchered’) the stump back into flat-headed configuration. Now it retracts safely in, I still have a good tool for undoing fasteners and other… erm, stuff, and I feel like a million dollars. 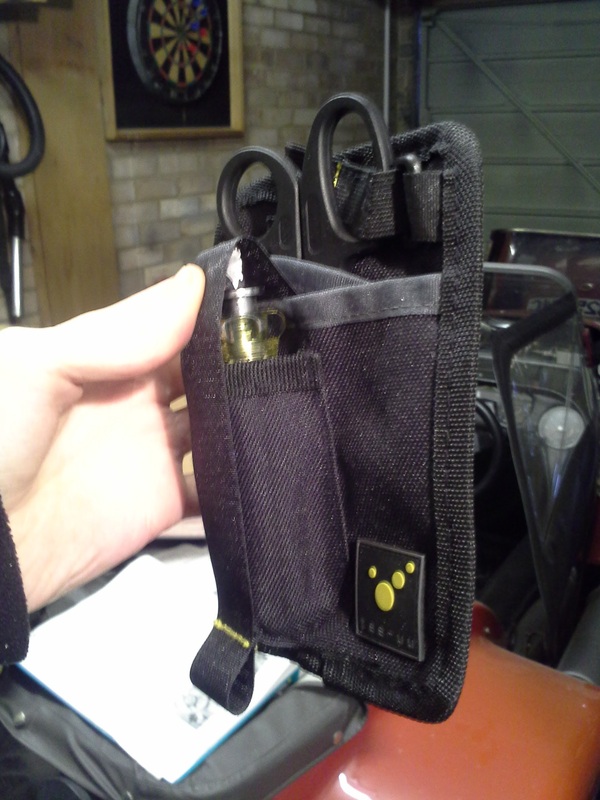 It even fits snugly in my pretentious utility belt. Laurent Mekies is the deputy race director for all F1 events, taking over from Herbie Blash full-time this year. Laurent focused on the work of the FiA Global Institute. Carrying out around twenty projects at a time, these range from barrier configurations (redressed after Sainz’s Sochi impact, where the car decelerated from 153kph – around 95mph – in just 4 metres) through car design and even the testing of the safety testing measures. Interestingly, preventing accidents is not in their remit, only the mitigating of their effects. More on this later. Sid Watkins was working on an F1 airbag that was eventually replaced by the current Frontal Head Restraint system – the HANS device. The FiA carries out about twelve in-depth accident investigations each year across all FiA series, although if a national motorsport body, such as the MSA, has a major incident it can draw on the Institute’s expertise. Original testing of the Techpro barrier system was many years ago, and incremental changes gradually took the concept out of its optimum operating window. New configurations are now certified up to impacts at 165kph ready for F1 2017. The FiA also liaises with other series such as Nascar and Indycar over requirements. Tracks are designed to funnel cars to accident zones. This is done by using concrete and armco barriers close to the track on straights and in braking zones so that any car that loses control is sent down the straight-ahead, where run-off, barriers and medical staff are concentrated. Indeed, some tracks have been asked to move barriers closer to the track for this purpose. The Sainz and and Alonso accidents are good examples of this. Finally, I spoke to Laurent to ask him about that original remit – mitigating accidents, but not preventing them: Where do track limits feature? Track Limits Can Be Fun! No, wait, this is a fun one! I was at Oulton Park, flagging for the British GT championship. I was at… that corner. The one with the chicane. It goes hairpin, long right into chicane. I was flagging the chicane. So Abbie Eaton (former MX5 supercup champ and driver coach to the slightly starry) has brake-failure in her Maserati. She comes in with some of the wheels locked, very fast, and a lot of sideways. The left of the chicane is marked with a massive kerb. The Lamborghinis where lifting both rear wheels off the ground here (rear roll stiffness high, engineers fighting understeer). The right has a pile of tyres at the apex. Bolted together, but not to floor. Luckily. Ms Eaton fought for control but when you’ve no brakes… and she clouted (definitely clouted) the tyres with the Maserati’s door. She eventually stopped, checked for on-coming and rejoined safely, returning to the pits. Which was sensible. The tyres (clouted) acted with less sense, but we forgive them because THEY ARE TYRES and bounced, rolled, flew, jostled themselves across the track, across the grass, up the barrier and against a wait-high wire fence in front of a phalanx of spectators. Last weekend was my last trackside. The Donington Park ES team organised a meal (pie, good) and kept the Donington Collection open late for marshal’s to look round after a weekend of racing with the BRSCC. I’ve not been since I was diddy, and having learned so much about racing history and F1 it was pretty heavy-hitting. I realised later that I’d taken a number of photos of cars belonging to drivers who’d died behind the wheel. That might sound grim; that’s because it is. I see a Jochen Rindt Lotus 72, and I go WOAH! Then I remember he died in one at Monza and I realise how much I can overreact emotionally. I mean, like, tears. I bimbled round, until I was the last person there and the manager (elderly gent) came round to check no-one was hiding in the footwell of a V8 BRM. I helped him lock up, and we passed the display of Roger Williamson cars and various-abilia. Roger was a protegé of Tom Wheatcroft, who owned Donington and the collection. He died when his F1 car rolled and caught fire. Another driver, David Purley, pulled up and tried to right the car and fight the fire. Marshal’s didn’t have fire-retardent overalls, few fire extinguishers and the track’s fire tender took eight minutes to reach the accident… once it was released… whilst the race continued. I’ve seen the footage, but I won’t watch it again. Above the terror, and the anguish, and the sadness, I feel pissed off. Earlier on, at the Old Hairpin, we had a Volkswagen Golf hit the gravel trap and roll three or four times before hitting the barrier and coming to rest on its side. I arrived on the scene 30 seconds later, with an incident officer in direct radio contact with race control, smelling fuel but with a fire extinguisher in my hands. The electrics were isolated. A rescue unit with paramedics, extrication tools and a doctor/surgeon arrived 30 seconds later. The driver climbed out and walked away. The car didn’t catch fire. I haven’t done Brands Hatch yet. So there’s that. Indy and GP track, but GP track especially, because its the GP circuit. I haven’t done Anglesey, although I nearly did earlier in the year. I was at Oulton Park for British GT and, having driven a squillion miles to get there, and having the Sunday off, thought, hmm, yeah, its only over there, and there’s racing today. But no, dear reader, I did not drive another squillion miles to Anglesey on a whim, because the Monaco Grand Prix was on in the clubhouse. And the Indy 500. And Steve McQueen’s Le Mans. But I should have. Where else? In the UK, there’s Croft, and Castle Combe. And Knockhill. Closer to home, there’s Rockingham. Oh jeez, there are loads aren’t there? Hillclimbs? And sprints? The nearest are Blyton Park, which I’ve visited for a driving experience day, and Harewood House. Which I haven’t. I wish I’d signed up for Formula E when the UK still had a couple of rounds. Hopefully that will be rectified in the future, and I’ll get the chance to put the marigolds on. Of course, further afield, everyone wants to do Le Mans. You just have to. Before that, I’d probably want to do a 24hr of slightly less importance first, for a chance to plan my meals. Reports that if you crash at Le Mans by a French post at mealtime, you’re on your own are completely false. Probably. Getting ambitious, there’s the Daytona 24, and the Bathurst 12. I’ve heard of a few UK marshal’s traveling to Abu Dhabi and Bahrain for F1 and endurance racing. But I burn really easily. When you’re learning to flag, or if you’re flagging at a post you’ve not done before, it can be helpful to go onto track and have a look from the drivers’ point of view. You look where their eye-line will be, where they’re focusing, how far they can see you from and so on. If you ever get a chance to drive the track at speed, or passenger for a lap or two, you’ll really see the way a post can appear from nowhere over a crest and disappear just as quickly. Some posts are so far from the track that they only feature in your peripheral vision as you focus on your next reference point. So after this weekend’s racing (750 Motor Club at Cadwell, where I was flagging on post 1 Sat and 5 on Sun) I got in the car to drive back to the paddock. The last race had been red-flagged after a car dropped oil round the circuit and caused an MGB to somersault over the barriers at Barn (everyone ok). @SplitTimes Everybody fine, thank you. I was parked on the big hill inside the circuit. I love driving the track to post in the morning and back in the evening. What a privilege, and a little heel and toe makes it that bit magical. So I let the engine warm up a little, then trickled down the hill onto the circuit at the bottom of Mansfield, then revved it out a little under the spectator bridge. I touched the brakes gently at Mountain bottom, and lent my foot across to blip the gas down to the third. The front right wheel locked and the increased braking on the left stepped the car toward to the apex a little more vividly than I’d expected. Releasing the brakes and rolling through, I realised there was still oil down. I’d come in a bit under 60. What it must be like to hit oil at double that, I don’t want to imagine. But the next time I hang a stripy out I’ll understand a little better. I tend to use paddock bars and cafes to charge my phone. And use the wifi. But its ok, because I always buy something. 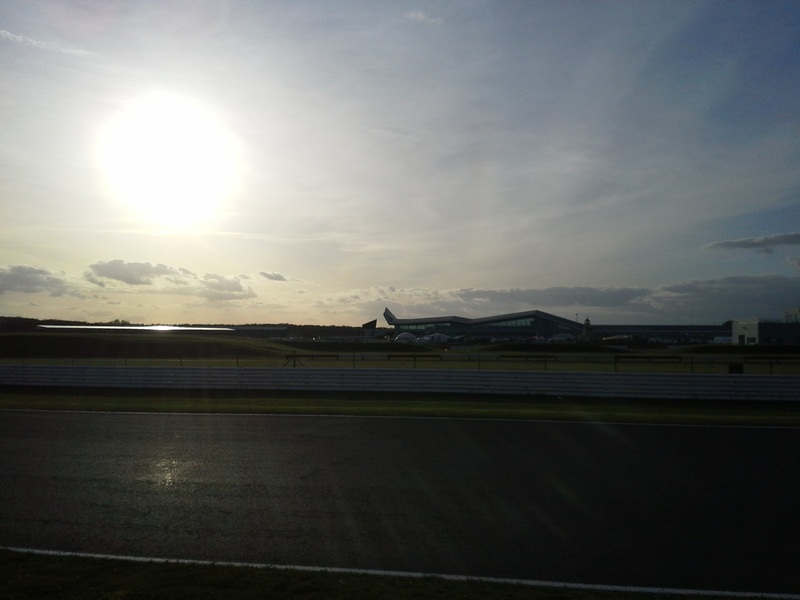 Silverstone, I think it was the Friday of the WEC, and I might have had a large whiskey, because, you know, it was bloomin’ freezing. Then it took a while to charge, so yeah, I bought another. Well, I had a voucher. So I got back to the campsite and made some pasta for my poor little tummy. I filled the saucepan with water to wash it out (ever vigilant of my own cooking). Up to the fence where the new copse is growing to fling away the water… and the pan went with it. Then I fell over the fence while I went and fetched it. Twice. I’ve been sat at charging duties there and watched French mechanics cheering as someone launched a borrowed folding bike down the steps outside then crashed into a picnic table. At Oulton Park, the British GT meeting went Saturday, Monday, with Sunday free to mooch. I mooched diligently (in bed) until the sun turned my tent into a sweatbox, braved the public showers (no verucas so far) then wandered the grounds of the beautiful track. Suitably sunburned, I headed for Checkers, the clubhouse to grab a front row seat for the Monaco GP. I bought a tea, a bottle of coke and a banana (staggered stints, you see). The place gradually filled with mechanics and drivers and other camping marshals, and it was a great atmosphere, with groans and cheers and a dignified applause at the end for old Lew. A bit of begging from me, some cajoling from the Carlin mechanics and we got the Indy 500 on. Which was awesome. Then a late showing of Steve McQueen’s Le Mans. It’s now 9.30 at night and I’ve been in there for TEN HOURS. And I forgot to charge my phone. Episode 2 of the Track is Live videoblog has me looking at my upcoming visit to Oulton Park for British GT. Which is that way <—- (ish). Make-up by Lily, aged 6. Racing fan, flag waver and car pusher.